To celebrate the 119th (or so) Team Fortress 2 update, Valve is releasing a series of very cool, and very expensive-looking, TF2 collector's statues. The newest update to Valve's online shooter adds three medals - gold, silver and bronze, naturally - to indicate the length of a player's service to the Team Fortress cause, along with a few other fixes and adjustments, like a 20 percent damage bonus to the Backburner, a fix to the particle effects of the teleporter exit and a change to the server browser to ensure it saves filter settings properly. But what's really interesting is how Valve has decided to commemorate the event: By hooking up with collectibles maker Gaming Heads to launch a series of highly detailed, 12 inch tall Team Fortress 2 figurines. 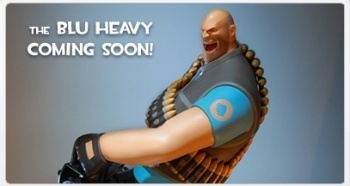 The first figurine out of the gate will of course be the Heavy Weapons Guy, the iconic, howling Russian brute who's come to symbolize everything crazy and cool about TF2. The Heavy will be available in both Red and Blue, and in two unique poses: Murderous bellow and pensive slow thought. Original game files will be used to ensure an "accurate and artistic representation" of each statue. Preview images of the Heavy statue look absolutely awesome. They also look absolutely expensive. Preorders won't be taken until May 3 and until then there doesn't seem to be any way to determine how much one of these things will cost, but I think it's safe to say that you won't be buying any of them for your kids to play with. And for Valve fans whose tastes run toward the less-goofy, Gaming Heads will also be producing similar statues based on the Half-Life 2 and Left 4 Dead 2 games as well as a series of "life size props." A full-sized Lamarr that I could wear as a gag hat? Yeah, I'd pay for that.